Salt Lake City has an ordinance on the books dictating the color, location and fee schedule for sidewalk news racks, but hasn't enforced it for several years, according to city officials who, on Aug. 19, petitioned the Salt Lake City Council to tighten the ordinance. Under current law, news-rack owners are supposed to renew their license with the city each year and pay a $5 fee per news rack. But Wayne Mills, a senior planner with the city, says the better part of a decade has passed since the city regularly sought to collect the fees. "The city hasn't taken anything in for quite a bit of time because people haven't been renewing their licenses," he said. But neither has the city sought renewal of the licenses. The last time City Weekly received an invoice for its 76 boxes in the downtown area was 2005. And fees aren't the only part of the ordinance that aren't being enforced. Size, color and height restrictions for news racks have also fallen by the wayside. The current ordinance states that news racks must be painted flat black and be no taller than 3 feet in most locations, 2 feet wide and 3 feet deep. City Weekly, USA Today, and the two local dailies all participated in discussions during the 1990s that redefined that ordinance and how it would be enforced, and designated who could put papers in downtown kiosks and how they would be displayed. Then, according to City Weekly publisher John Saltas, "the city gradually dropped the ball," but not before City Weekly spent thousands of dollars on new racks and repainted its fleet of red news racks black. Saltas still loathes the color restriction, saying that he believes news racks should be an array of colors to reflect the personality of the publications and the city itself. 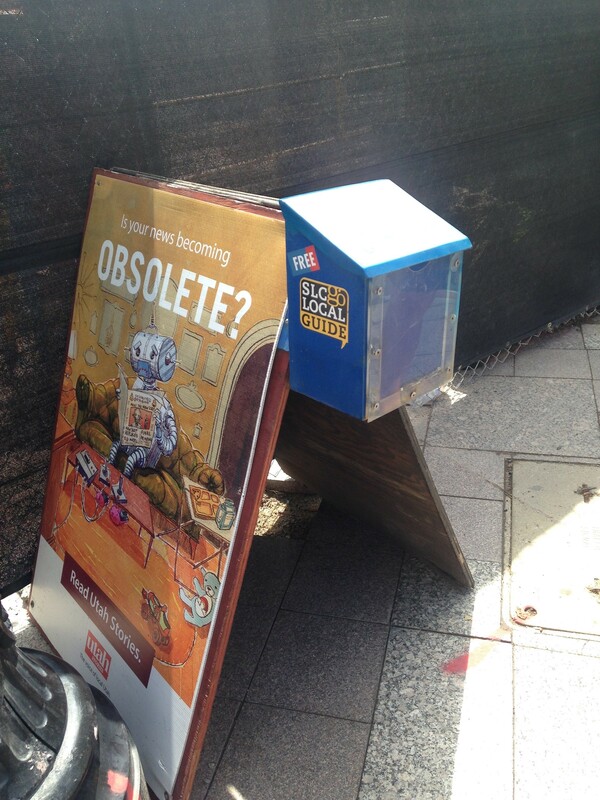 City Weekly has installed a number of art boxes, designed and painted by local artists, around the city. Marketing Manager Jackie Briggs says the idea came from the San Diego Reader, which, like City Weekly, was having problems with taggers using the plain black boxes as their canvas. “We partnered with the Utah Arts Festival in 2010 to have a booth there, where we’ve displayed the boxes before we put them out on the street,” Briggs says. The boxes have been popular with business owners. “Every year, there are people who say, ‘When you get your new art boxes, we want one,’” Briggs says. And the colorful art boxes are less likely to be disfigured by spray paint. 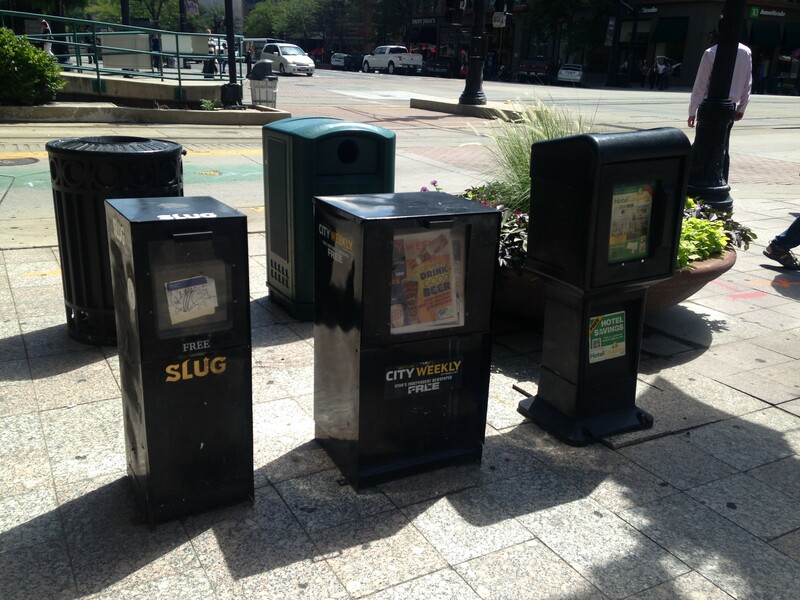 One of City Weekly’s news racks on 300 South downtown near Squatters was the victim of repeated graffiti, to the point that the box had to be removed entirely. After Squatters requested one of the art boxes be placed there, it’s had no problems. “When they’re painted boxes and you can tell there’s been a lot of craftsmanship put into them, people are less likely to damage them,” Briggs says. Over the years, Saltas says, it's been the city's failure to enforce its own law that frustrated him most. And, now, in the face of heightened fees (the city has proposed charging news rack owners a one-time permitting fee of $200, plus vigorous enforcement of a $10 fee every two years per rack), Saltas says he wants nothing more than the city to enforce its law or rewrite the ordinance—fees be damned. "For using public property, we should pay, but everyone should pay uniformly," Saltas says. "News racks that were out of ordinance kept popping up and the city did nothing. Giant racks shaped like houses. Plastic racks. Racks with outsized logos. There should be an ordinance just for public-safety reasons alone, but—as Mayor Becker told me in my office when he was first elected and I asked to talk about this issue—ordinances need to be enforced or there's no use having them. I guess he got sidetracked." Mills says the city's ordinance was difficult to enforce because it forced news-rack owners to police themselves. For instance, he says, news-rack owners are supposed to tell the city when they change the location of news racks. This, he says, rarely occurs, making it difficult for the city to know for certain how many news racks even exist on its streets. Part of the proposed ordinance would require the city engineer to oversee enforcement. Currently, the ordinance is overseen by the zoning administration. Mills told the council that an effort will be undertaken to digitally map every news rack in the city. And, according to the proposed ordinance, news-rack owners must submit a site plan for all of its news racks. Before a news rack is moved, the owner must inform the city, and a review must be completed. "In the 13 years I've held this position, Mr. Mills has been fair throughout," adds City Weekly distribution manager Larry Carter. "If there were a issue, he was always accommodating; always quick to let us know if our street boxes were in compliance with the city ordinance." Under the current ordinance, news-rack owners are supposed to reapply for their permit each year before July 31. This year, July 31 came and went without a single news-rack owner filing for a renewal. Mills said this, in effect, means that every single news rack in the city is out of compliance. A distribution employee for MediaOne, the company that distributes The Salt Lake Tribune and Deseret News, declined to comment on this story. "We weren't doing much about it and so it just kind of died off," Mills said of enforcement, noting that the city now deals with news rack issues on a complaint basis. But the days of renegade news racks appear numbered. The council will consider the new ordinance in a public meeting Sept. 30.